Following the tradition of every Pixar movie since Monsters, Inc., Chronicle Books has announced the release of The Art of Cars 3, including the reveal of the book's cover this evening. Not only are we eagerly anticipating the May 16, 2017, release, but we're also thrilled to get this early look at the cover art — a clear indication of the beautiful and insightful concept artwork which will fill the book's pages. You can pre-order the book from Amazon, Barnes & Noble, or direct from Chronicle Books. The official book description, as well as details from the book's contributors, is below. Pixar Animation Studios presents The Art of Cars 3, a behind-the-scenes look at the concept art from the latest film in the popular Cars series. Fascinating storyboards, full-color pastels, digital paintings, and more offer a unique perspective into the beloved world of Lightning McQueen and his friends, new and old. With a preface by John Lasseter, foreword by director Brian Fee, and an introduction by pro­duction designers Bill Cone and Jay Shuster, The Art of Cars 3 is a scenic road trip through a masterfully animated film. John Lasseter is a two-time Academy Award® winner, director, chief creative officer at Walt Disney and Pixar Animation Studios, and principal creative officer at Walt Disney Imagineering. Brian Fee is the director of Cars 3. He worked as a story artist on the Cars films, Ratatouille, WALL•E, and Monsters University. Bill Cone is a production designer on Cars 3. He worked as a production designer on several short and feature films including A Bug’s Life, Toy Story 2, and Cars. Jay Shuster is a production designer on Cars 3. He worked as a character designer on Cars, WALL•E, and Cars 2. 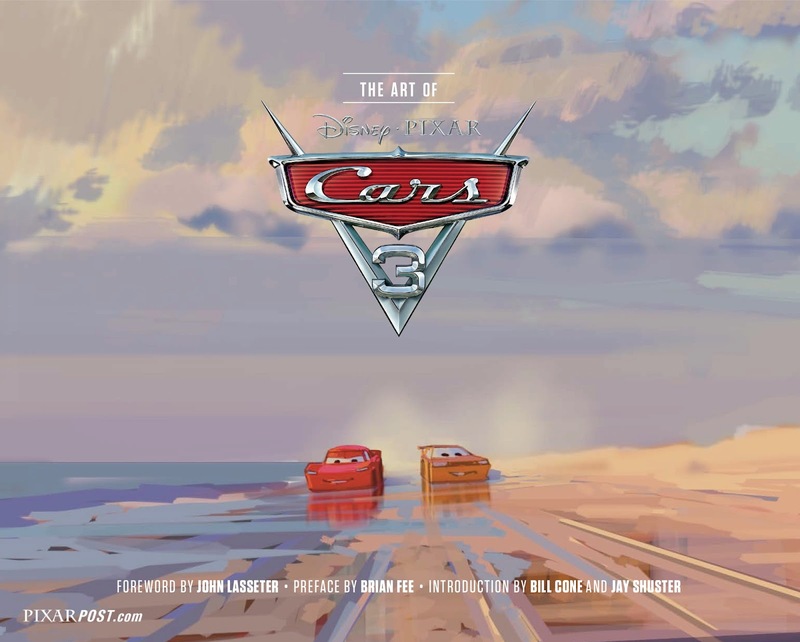 The Art of Cars 3 Book cover was just revealed along with additional details surrounding the contents. Read more.